The idea is great. The place, the Islamic Cultural Center in New York, looks fantastic. Three bottles of Coke for the thirsty, two plates of biscuits to the hungry, and numerous chairs for the tired bones who are not learned in the art of sitting on the floor welcome the herd of Jews entering the largest mosque in New York city. In addition, a number of great theatrical characters are at the ready to engage the minds of the unlikely visitors: Two Imams, a Rabbi, an Attorney, a Doctor, two Blacks, a few Whites, and countless Poland Springs on the panel’s table for the distinguished participants. Can’t beat it: PC paradise at its best. The only thing missing to complete the picture is a Yoga teacher. This is going to be fun, I find myself mumbling with joy. First hurdle is successfully overcome. The two people, thank goodness, believe in the same God. If this keeps going on in similar tempo, peace will soon descend on Arab and Jew world over. Surprise, surprise, the two men agree. And Sheikh Samer concurs. This Trial, so to speak, is conducted by the book: The Attorney character prepared the questions well in advance and he reads them, one by one, from a notebook he’s brought with him to the event. And an audience of a few hundred, mostly Jews, listens. You can tell that most of them are Jews because nine of ten in attendance sit on chairs. Another way to figure out Who’s a Jew is the applaud patterns: Jews applaud after Rabbi Schneier speaks, Muslims applaud after Imam Omar speaks. The Jews applaud. But the Muslims stare. And then quite a few of them leave. No, not because they got upset; they simply got bored. The heroic Jews they have been told about resemble more a lamb than a lion. But even with the audience constantly shrinking, Dr. Israel Singer of the WJC, gets up to speak. When the media is around no Jewish leader is stupid enough to pass an opportunity to grab a microphone. Looking at all the Jews around him, he feels comfortable. He quotes the Bible, he quotes the Talmud, and he proceeds to give a nice Shabbat Speech to them. What does it have to do with this event? Not much in particular, but who cares. Good that we got this clear. No one applauds. A rare moment of real unity between Arab and Jew. Will this extend itself into something bigger and better? This event was not a mere insult to intelligence, it was far worse: It projected the Jews as a bunch of fearful and childish individuals, while the Muslim stood their ground with dignity. 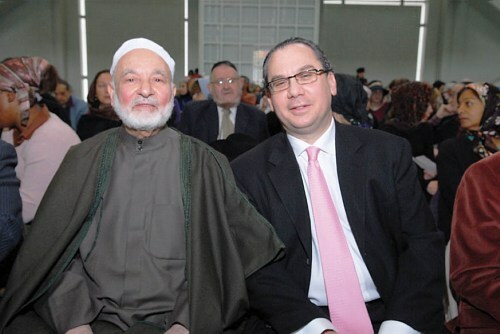 The Imam was gladly wiling to talk “politics,” but not one Jew agreed to join. The Jews were so happy that they were allowed their two hours in the mosque, and ever so glad to see reporters, that they adamantly refused to “ruin” the party. The questions posed by Attorney Cohen reminded me more of a kindergarten than anything else. It won’t be surprising if by next event, if there’s going to be one, the Attorney will ask: Now kids, do you know how to spell God? The depth of ideas presented here was paper-thin and this “Dialogue” left much to be desired. The rush to call the media for an afternoon of a dialogue between Arabs and Jews was more than just premature; it smacked of endless desire to see one’s name in the papers for purely egoistic ends. A man who holds an honorary doctorate and parades in public with the title of doctor is not my Dream Man to solve the complex Mideast conflict. Their sad followers, who spent their Sunday in a mosque so that they’d be given a chance to beg an Imam for love, shouldn’t be anyone’s Dream Team to serve as mediators for any crisis, let alone this one. By 3:15 pm, when all was said and done, it was a clear 1:0 for the Imam. I can see Sheikh Samer nodding his head now, a huge smile spread on his face.